Once the Oral Surgeon has placed the implant and allowed appropriate time for the bone to heal and integrate with the implant, the patient will be released from their care and returned to WFD for restoration fabrication. An impression will be taken and sent to the lab to have crown or bridge made. 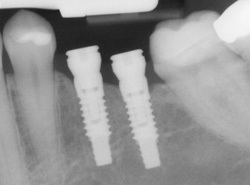 At a subsequent appointment the crown / bridge will be cemented onto the implant abutments.